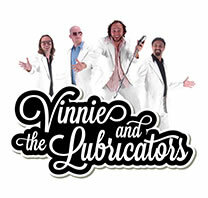 Vinnie and the Lubricators play a line-up of songs sure to satisfy show-goers of any generation. They play your favorite songs from the 60's, 70's 80's and 90's including top selling artists like Stevie Wonder, James Brown, The BeeGees, The Police, Men at Work, The Allman Brothers Band, Bob Marley and many more. Vinnie and the Lubricators encompass a wide range of genres in their music, offering elements of classic rock, country, blues, and soul with hints of reggae and funk thrown in the mix.